Central Park's 843 acres include 136 acres of woodlands, 250 acres of lawns, and 150 acres of water in 7 waterbodies. 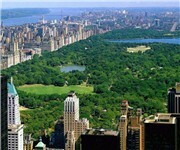 The Park's six-mile perimeter extends from Central Park West to Fifth Avenue and 59th Street to 110th Street. How Would You Rate Central Park?